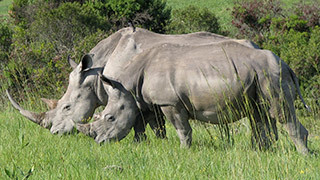 The rhinoceros is one of the largest extant mammals, some weighing over a thousand kilograms. They have a thick skin and a large horn they can use to defend theirselves. Pretty much their only enemy is humans, who tend to kill them for their horns, which are sold on black markets. The animals live mainly in Africa, with some species exclusive to South-East Asia.